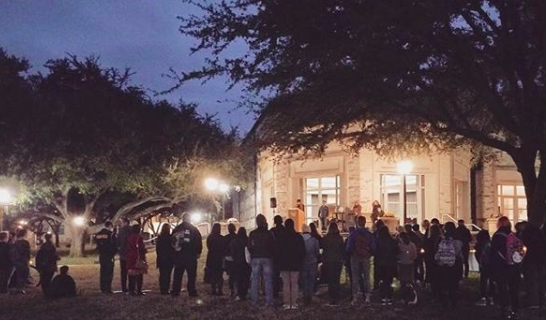 On November 19, Southwestern observed the Transgender Day of Remembrance for the second time in a row by holding a vigil on Academic Mall. Officially, Transgender Day of Remembrance is on November 20, but the vigil was held a day early this year. This event serves to remind people of the hate and violence transgender people face and the ways these hate crimes are pushed under the rug. To learn more about the history and what Southwestern did last year for Transgender Day of Remembrance, please read the article about this from 2017. For this year’s vigil, fake candles were passed out this year for anyone for attended the event, unlike last year’s flowers. Flyers were also handed out with transgender violence statistics, a quote from the founder of the event, and ways to commit to being an ally for the transgender community. There was also a desk with a poster of all the transgender victims of this past year. Attendees were also encouraged to write down something on the poster to commemorate the victims. Once the event officially started, audience members were encouraged to turn on their candles. There were four speakers for the event. The opening speaker was Kayla Ingram, the president of Pirates for Pride. This organization is the LGBTQ+ club on campus that offers a safe space for students who identify as queer, questioning, or as an ally. “This vigil is intended to commemorate and memorialize, and give us time to think back on the murders that have taken place during the last year as a result of being transgender and transphobic violence worldwide,” said Ingram at the beginning of the vigil. The next speaker was President Edward Burger. This was his second time speaking at the event and offering words of hope and encouragement for students on campus. “We take a moment to pause and honor the memories of those lives taken from us solely because they peacefully lived their authentic selves,” said Burger. The third speaker was Kat Kelly who spoke on behalf of Bel Mandelbaum. Mandelbaum is writing their history thesis on the “historical precedence of trans people.” They were unable to attend the event but still wanted to contribute to the vigil. “Being trans is not a recent phenomenon, as long as the ideas of gender have been strictly defined there have been people who do not fit into those definitions, who do not feel understood, who long to become something than what the world thinks they are,” said Kelly. Bonni Erizo, the vice president of operations for the PFLAG chapter in Austin, was the final speaker for the night. PFLAG is national non-profit organization that provides free support groups for LGBTQ members or allies. Erizo told the crowd a story about about when her son came out as transgender right before college and how she feared his new school wasn’t affirming. Her story ends with the school being accepting of her son and talks about how he is thriving on his campus. After the speeches, four members from Pirates for Pride read off the names of transgender people who were murdered since last year’s Transgender Day of Remembrance. The official requirement for a name to make it on the list is that is has to be confirmed that the individual was murdered for being transgender. This means cases of suicide, domestic abuse, or violence that did not kill the victim are not included in the list. The result is the list not being fully representative of transphobic violence. This year, 369 names were read off the list at the vigil; an increase from the 325 names in 2017. After the names were read, a moment of silence was held. Audience members were encouraged to set down their candles on the hill after they had finished their silent thoughts or prays. This concluded the vigil, but many people stayed after to discuss the event amongst each other. In an interview after the vigil, Ingram reflected on this year’s and last year’s vigils. While she said it looked like there were less people in the audience, the number of candles this year was the same as the flowers handed out last year. The increase of deaths from the previous year was also disheartening, but Ingram stressed that this means there’s still a lot of progress to be done for the transgender community. “It’s a reflection that there’s still work to be done and there isn’t a linear path. It doesn’t get better every year,” said Ingram.